Hi, everyone! I am brand new here, and will be the very first to admit that cars are not within my realm of expertise. Please forgive me if I come across as not being too bright. My car is a black 2010 S40 2.4i, that was a retired demo car when I bought it in 2011. It had roughly 7700 miles on it when I bought it, and now has a little over 42,200. I really don’t drive all that much. When I do drive, it’s all in the city. My issue is that I keep ending up with bent rims. This happened twice in 2015, after a particularly cold and wet winter, so the roads weren’t in super great shape, and then again this past Sunday. Every time, it has happened to the wheel in the front passenger side position. In 2015, it was the same wheel both times. That wheel has since been rotated to the rear driver’s side position, meaning that I now have two different wheels that have been damaged (the wheel damaged in 2015 has been repaired twice). Yes, I accept my share of the responsibility, here. After the second bent rim in 2015, I actually stopped driving in the right hand lane, as that is where most of the potholes seem to be here (Dallas). I was in the left hand lane when I his whatever it was that bent the rim on Sunday. I was on a road that had recently been resurfaced, and did not see what I hit. I don’t drink and drive, I don’t text in the car or let myself get distracted by the radio or a/c. The roads here aren’t perfect, but it’s not like a city where I used to live where people actually broke axles hitting potholes. So, my questions are: Could the chrome wheels have something to do with this? Is there any chance that they are more easily damaged than some of the other types of wheels? Also, could it be that my tires aren’t offering adequate protection? The car came with Michelin sport tires that have a relatively low profile. My options right now are fixing the wheel (if the damage is reparable), buying a new wheel (I have located someone online who is selling used matching wheels), or, if these wheels are known to be more prone to damage, getting a new set of more durable wheels. I am due to replace all of my tires soon, so if it would be helpful to get tires with a higher profile, I can do that, too. Thank you so much in advance, and again, I’m sorry if I sound super dumb. 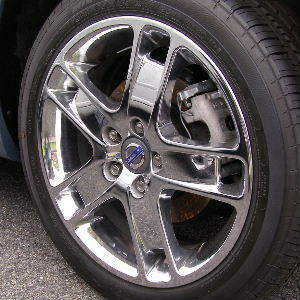 If it’s helpful, here is a picture of the style of wheel I’m talking about. It’s not one of mine, but this is what mine look like. Last edited by mt6127; 11-22-2017 at 08:27 PM.